For those of you that don’t know, Hot Toys is a toy company based in Hong Kong who are renowned for their almost life like 1/6 scale figures. They cater strictly to those with a large amount of money to spend on such things, as each figure costs anywhere from $200 to $300 on average. They tend to pick up the licenses for big block buster movies, and last year they released figures from The Avengers. Today I’ll be looking at their take on Captain America from that film. 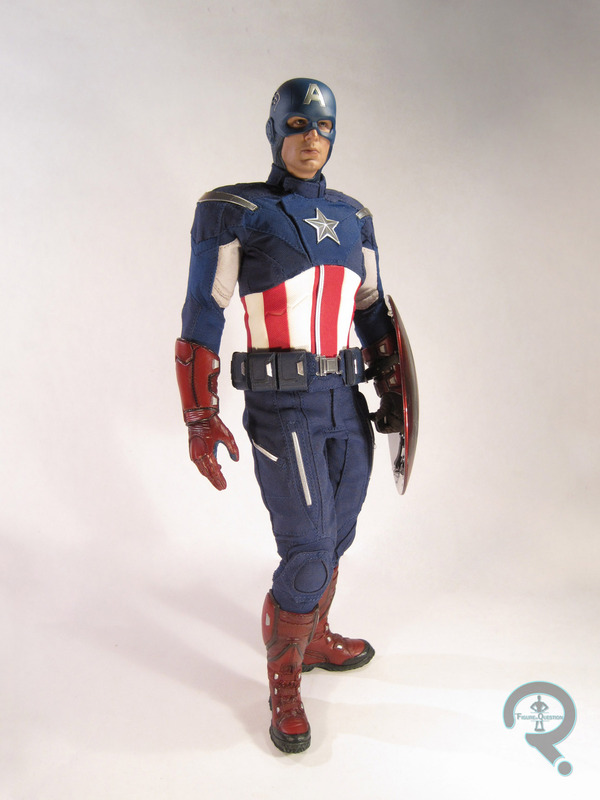 So, like I mentioned before, this figure is based on Cap from the Avengers movie. He was #174 in Hot Toys’ Movie Masterpiece Series. The figure stands about 12 inches tall, and has a whole lot of articulation. I don’t know exactly how much, as most of it is hidden by his costume. So I’m gonna just go with a bunch. I’ll look at the basic head here, and the extra head in the accessories section. The basic head depicts Cap with his helmet/mask on. The helmet appears to be a separately molded piece, but it’s not removable. Sculpt wise, all the details look great. I’m not sure that they’ve quite gotten Chris Evans’s likeness down, but they’ve came pretty damn close. The helmet is pretty much a miniaturized version of the actual one from the film, with pretty much every little groove and detail included. The under-the-helmet-hood is also well done, simulating the texture of the fabric impressively. Paint is one of Hot Toys’ strong suits, and this figure doesn’t disappoint. The level of detail and the lifelike quality is nothing short of amazing. Viewed from the right angle, this figure could pass for a real person. This is kind of a new category for me, as the costume features few sculpted pieces and very little paint. That isn’t to say he has no sculpted pieces. He’s got his hands, boots, gauntlets, the chevrons on his shoulders, his belt buckle, and the star on his chest. These are all fairly well executed, although, the boot and gauntlet sculpts may be a bit on the soft side, sculpt-wise. All of the sculpted parts are painted quite well, with no slop or bleed over. So, I’ve looked ate the sculpted parts, now I’ll move on to the rest of the figure’s costume, which is all cloth. Cap’s costume is tailored specifically to fit his body, and is handled with two main pieces: Shirt and Pants. Most of his uniform is made from the same coarse blue fabric. I find it’s a bit on the dark side for Cap’s look from the movie, but it isn’t too bad. The costume is assembled from multiple layers, which really adds to the realism. The alternate head is pretty good. Once again, I’m not sure they’ve completely captured Evans, but it’s hard to tell given the choice of expression. I don’t really know why they decided to go with an angry expression for the unmasked head, since that isn’t very characteristic of Cap in the movie, but I guess it looks okay if you’re going for more of a battle-damaged, end of the movie look. The head switches out at the base of the neck, and does so with relative, which is nice because it means you don’t have to man handle you’re $200+ action figure. 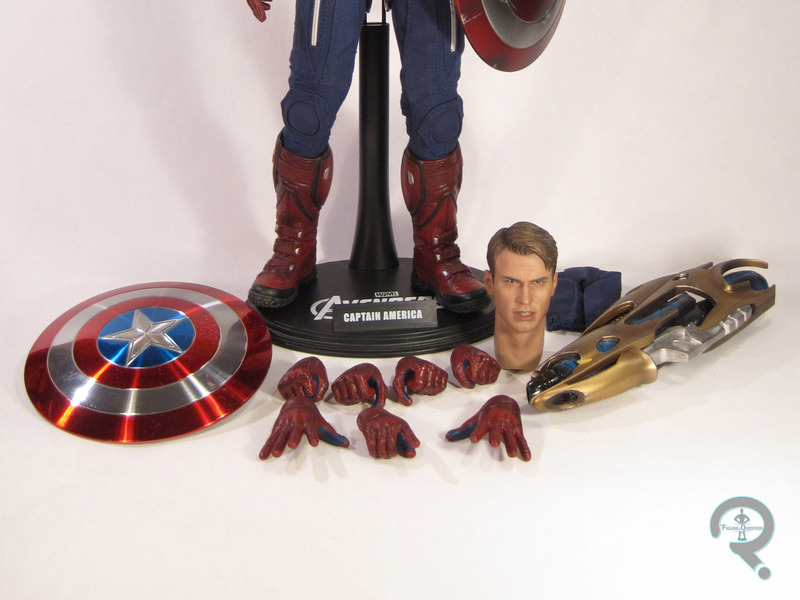 The alternate head is complimented by a hood piece to replicate what Cap’s hood looked like when he pulled it down in the movie. It’s pretty much just a piece of blue cloth. It’s okay, but it has difficulty hanging properly, which can look a bit awkward. It’s attached via two snaps that hook on the inside collar of the costume. They’re unreliable, and don’t tend to hold well. Overall, this is kind of an extraneous piece. I’m glad they included it for those that want it, but it’s not something I ever plan to use. Cap includes seven hands in addition to the relaxed pair he has on in the box. The hands include: gripping(R and L), Pointing(R), splayed(R and L), and fists(R and L). They’re all sculpted well, and offer a nice variety of gestures. Cap’s most important accessories are his mighty shields. He includes both a clean and polished one and a scuffed up, battle-worn one. The clean one is vac-metallized, which is a decision I question, as it doesn’t really accurately depict what Cap’s shield looks like in the movies. Also, if you’re unlucky, all to paint might start flaking off like some people have experienced, so there’s that. I much prefer the BD shield, as I feel it looks more like the one Cap carries in the movie. Cap also includes a Chitauri arm-cannon thing. He takes one from one of the aliens during the movie’s climactic battle, so it fits. It’s pretty cool, and can be plugged into Cap’s hand peg if you so desire. Lastly, Cap includes a black display stand with his name and the Avengers logo on it. When Hot Toys announced their Avengers line, this was a figure I wasn’t going to buy. I planned on getting the rest, and need to save the money for them. Plus, I already had Cap from his solo film. That should be enough for me, right? Well, as you can see, no, it wasn’t. I broke down and bought the figure because I really wanted that really cool Avengers set up, and First Avenger Cap just wouldn’t look right. I’m glad I bought him in the end, but man I am such a push-over on these figures. Congratulations on Review 100, man!